Butternut Squash Dip – Only 2 Ingredients! 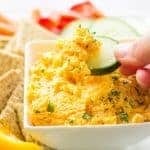 This creamy butternut squash dip contains just 2 ingredients! Grab your crackers and veggies and start eating! Serve with crackers, veggies, or pita bread! *If you like this recipe, leave a comment and rate it with some stars. Thank you!